Good morning, Friends! I hope your week is off to a fabulous start! It's been hard having to get up early after having spring break! I do love having the routine and having the house back to myself again, though! Seems like I can get a lot more done! March Madness was a lot of fun this year! And last night's game was really exciting! I am looking forward to seeing the Women's final game, too! Today's card was one that I did for a swap I was in recently. It was the Control Freaks swap and the theme was Flat and Fabulous. Our hostess wanted cards that could be mailed without extra postage but still have the "wow" factor. And this is the card that I came up with! 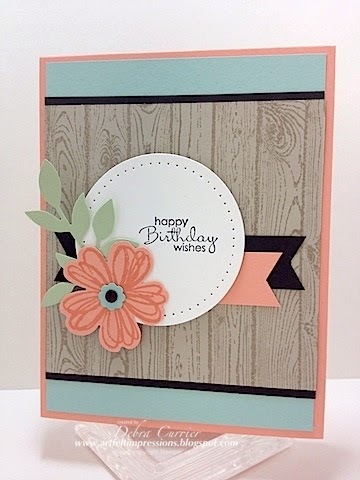 Deb, this is one of my absolute favorite cards from the recent swap! Love the colors, the layout, love everything about it...thanks for the inspiration!!! Love your flat and fabulous card! TFS!